HeinOnline now offers global access to a new collection, Slavery in America and the World: History, Culture & Law. Library card holders and visitors to our libraries can browse this collection through the library's subscription to HeinOnline. Slavery in America and the World: History, Culture & Law brings together, for the first time, all known legal materials on slavery in the United States and the English-speaking world, as well as materials on free African-Americans in the colonies and the U.S. before 1870. 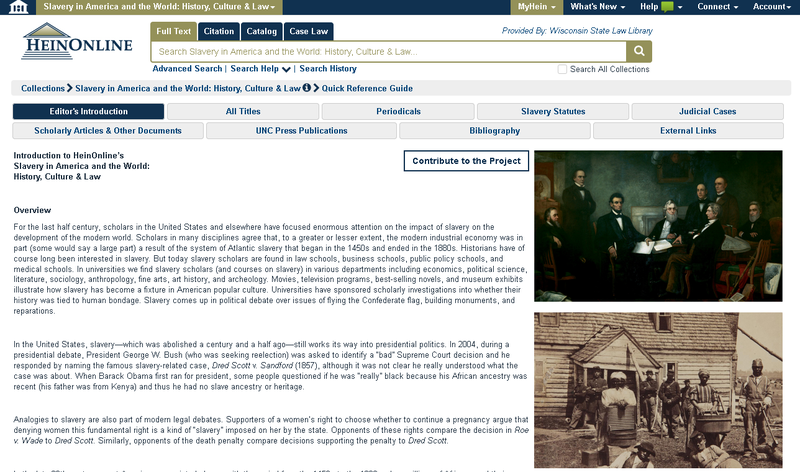 Included are every statute passed by every state and colony, all federal statutes, all reported state and federal cases on slavery, and hundreds of books and pamphlets on the subject. In total, the collection contains more than 1,000 titles and nearly 850,000 pages. While the collection is readily available to library users and cardholders, anyone can register with HeinOnline for free access to this collection. Visit the HeinOnline collection guide for more information and to register.